SANTA MONICA, CA (September 26, 2017) – Leading an all-star cast, Ryan Reynolds (Deadpool, The Proposal) and Samuel L. Jackson (Pulp Fiction, Marvel’s Cinematic Universe) take viewers on an outrageous action-packed, comedic adventure in The Hitman’s Bodyguard, arriving on Digital HD November 7 and 4K Blu-ray Combo Pack (plus Blu-ray and Digital HD), Blu-ray™ Combo Pack (plus DVD and Digital HD), DVD and On Demand November 21 from Lionsgate. When Michael Bryce, an elite bodyguard, and Darius Kincaid, a renowned hit man, are forced to work together, they don’t just have to avoid getting killed…they also have to avoid killing each other. The film, which was #1 at the summer box office three weeks in a row, also stars Oscar® nominees Gary Oldman (2011, Best Actor,Tinker Tailor Soldier Spy) and Salma Hayek (2002, Best Actress, Frida). The world’s top protection agent (Reynolds) is called upon to guard the life of his mortal enemy, one of the world’s most notorious hit men (Jackson). The relentless bodyguard and manipulative assassin have been on the opposite end of the bullet for years, and are thrown together for a wildly outrageous 24 hours. During their raucous and hilarious adventure from England to the Hague, they encounter high-speed car chases, outlandish boat escapades, and a merciless Eastern European dictator (Oldman) who is out for blood. Hayek joins themayhem as Jackson’s equally notorious wife. 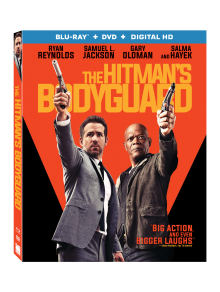 Directed by Patrick Hughes (The Expendables 3, Red Hill) and written by Tom O’Connor (Fire with Fire), The Hitman’s Bodyguard 4K Ultra HD, Blu-ray and Digital HD features exclusive bonus content including outtakes; four featurettes; deleted, extended, and alternate scenes; and audio commentary with director Patrick Hughes. The DVD will include director commentary and a behind-the-scenes featurette. The 4K Blu-ray Combo Pack, Blu-ray Combo Pack, and DVD will be available for the suggested retail price of $42.99, $39.99 and $29.95, respectively.